Blue Echohawk is about nineteen, and she doesn't really have anyone in her life. Her mother abandoned her with a stranger at a truck stop when she was two, and the man, who raised her, then died when she was a young teen, leaving her with his sister, who basically ignores her. It's no surprise that Blue isn't all that into things like school. So when Watson, a young new English teacher arrives, on the first day of her senior year, she sets out to torment him. But over the course of the year, it becomes evident that he might be the only person she knows who really cares for her. But he's her teacher, and he has a girlfriend, and he's so different from her, and it's all kinds of wrong. But as years pass and circumstances draw them together, it might not be so wrong any more. 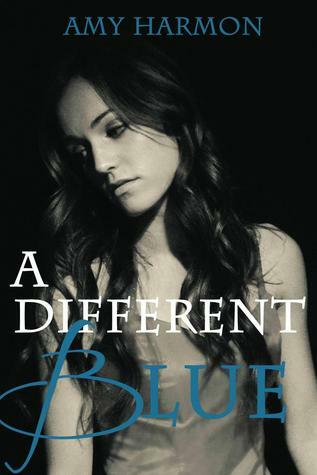 Despite the ick factor of the teacher/student relationship, I enjoyed this book. There were quite a few typos in the digital edition, which surprised and distracted me, but overall, I found the Blue/Watson story interesting and compelling. As an adoptive mom, it's a particularly important read. 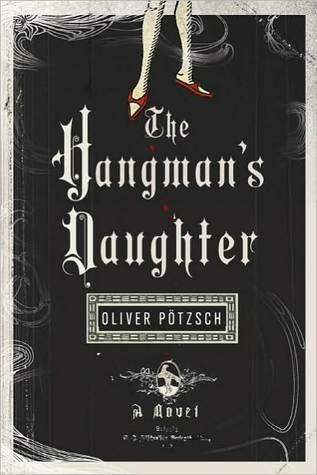 In a small German town in 1660, the Hangman is a necessity and a pariah. People won't make eye contact with him, and resent his presence in the church. His children are ostracized and no one except another hangman is allowed to marry his daughter. But this particular hangman, Jakob Kuisl, is more than just a torturer and a coldblooded killer, he is also a healer who knows more about medicine than either the old town doctor or his young son, the college-educated physician. When children are murdered and the newly-constructed leper colony burns down, and a midwife is charged with witchcraft, the town clerk quietly asks Kuisl to help him find the real perpetrator before the woman is burned. By day, Kuisl gently tortures his friend. By night, he and the young doctor (his daughter's lover) work to solve the mystery. While the historical elements of the book were very rewarding, at times the plot felt like the Keystone Cops-- lots of men running around in uniforms in the night and bashing into each other. Other times, the story felt completely ghoulish. This is the first in a series of at least four books, and while I enjoyed this one, I'm not running out to pick up the next one. 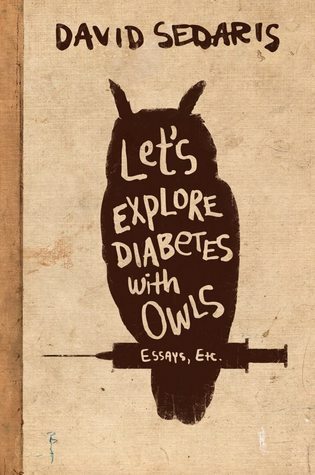 Title: Let's Explore Diabetes with Owls: Essays, Etc. A few months ago, Ed and I sneaked away one Sunday night to go to a David Sedaris reading. It was the week that Let's Explore Diabetes with Owls came out, and I hadn't read any of the essays yet-- I knew that just reading them on their own wouldn't compare with hearing Sedaris reading them to me (Yes, just me. If you were there, you must have been eavesdropping). He totally did the book justice-- his dog poems were hilarious, the story about the colonoscopy had me crying, and his political rants on health care even seemed sweet. I figured that there wouldn't be anything worth reading when I sat down and finished the rest of the essays. But I was wrong. The other night, Ed came into the bedroom, and I was convulsing. I think he thought there was something wrong, but I just couldn't catch my breath, I was laughing so hard. I tried to read the section to him, and it took three tries before I could actually read him the story. And while funny is good, the biggest lasting impression I have of the book is how Sedaris has a fantastic work ethic when it comes to writing. I like to fancy myself a writer, but I don't write every day (unless you count Facebook status updates). And while I'd love to write every day, I'm really good at making excuses for why I don't do it, when I manage to do things like run and read my scriptures every day. And do the laundry. You know, the important things. So while I was expecting just a fun read, I also got a lesson on what it would take for me to be a better writer. Have I started writing every day? Not yet-- but there's always tomorrow. 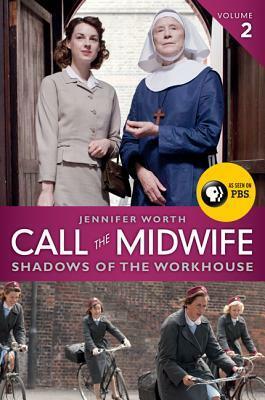 I was late to the Call the Midwife craze. I read the first book, then watched Season One and part of Season Two of the show, and then read the second book. I've always been a pregnancy and birth junkie, so I think that the first book held my attention really well because of the medical aspects of the stories. And then when I watched the show, I was surprised that there were all these extra side stories that weren't in the book. I assumed it was artistic license on the part of the filmmakers, but when I read the second book, here were all the stories about the old people of the East End. In Shadows of the Workhouse, Worth focuses on the East Enders who had grown up in workhouses, and how that legacy affected the community at large. All in all, I find that the filmmakers got it right-- while the show is primarily about the midwives' obstetric roles, they also roll in the stories of the elderly people. The way that Worth separates the stories into "midwife book" and "workhouse book" feels a lot less satisfying to a reader, especially to a reader who really likes the birth stories. Carmen plays the violin. Okay, so lots of teenagers play the violin (I'm the parent of a violist, and we chose that instrument precisely because so many kids play the violin). But Carmen doesn't play like most kids-- whining through their 15 or 30 minutes of practice each day. Carmen is a child prodigy. She has won Grammy awards. She has CDs. She plays a Stradivarius worth $1.2 million. Her fallback plan for next year, if she doesn't win the Guarneri competition, is to attend Julliard. The only thing standing between her and the Guarneri is Jeremy, her biggest competition. In many ways, Virtuosity is a fairly predictable romance. Carmen falls for the only boy who is wholly unavailable to her. And while Martinez does a nice job with the romance side of the novel, I think that Carmen's perfectionism and her dysfunctional relationship with her mother/manager are far more interesting aspects of the novel. While this book was probably only a 3-star read for me, I have a feeling that my daughter would consider it a 5-star read, so I settled on a happy medium. Last Sunday, it was time for church and I was reading Tiny Beautiful Things. I didn't want to quit reading, but I sighed, tucked my phone in my purse, and headed out the door. But the draw of the book was too strong, and I ended up reading 75 pages during sacrament meeting. I felt like I learned at least as much about how to be a good, loving person from Strayed (okay, about 100 times more from Strayed) than I did from the speakers at church. 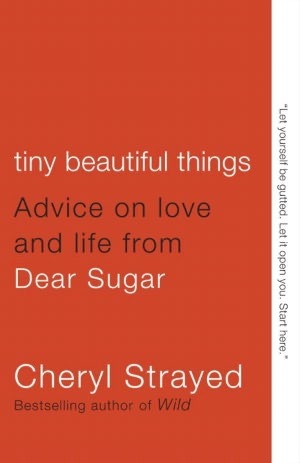 Tiny Beautiful Things is the compilation of some of Strayed's best "Dear Sugar" columns for therumpus.net, where she gives people advice on marriage, adultery, families, and all sorts of sticky situations. I find that the advice, although profane, is completely wonderful, wise advice. She calls it like it is, and she does it with grace and humanity. It's the kind of book that I want to come back to at times when I feel that I have lost my way. As a former English major and English teacher, I thought I knew about Scott and Zelda Fitzgerald. I'd read some of his novels and A Moveable Feast, after all. They were rich and wild and talented and crazy-- the poster children for the 1920s flappers. 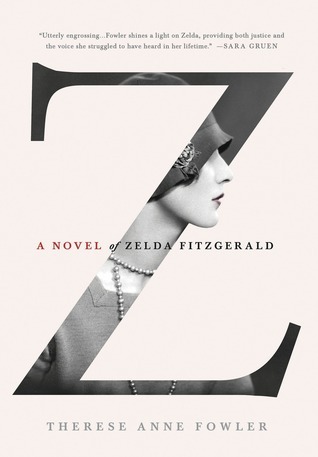 But reading Z demonstrated just how little I knew about the Fitzgeralds, and how it may be difficult for anyone to know about the intimacies of someone else's marriage. Z starts out when Zelda is about to graduate from high school and follows the trajectory of her life until Scott's death about twenty years later. It really zones in on the early years of her marriage when everything was bright and shiny and the couple could blow through forty or fifty thousand dollars like it was nothing. The thing that surprised me most about Z was the universality of ambition and ego. Scott reminded me so much of some of the guys I went to grad school with-- guys who were going to be WRITERS. I don't mean that there weren't women who wanted to be writers (this was an MFA program, after all), but rather than just writing, it seemed that Scott was somewhat caught up in the celebrity of what it meant to be a WRITER, to the point that actually writing became secondary. I was also struck by the way that Fowler was able to capture the way that Scott's ego increased and created a lot of the anxiety problems Zelda suffered from, and then he used those problems to justify his own bad behavior. It's been several weeks since I read the book, and now that I look back on it, what I remember most is how it was an insight into a marriage even more than an insight into Zelda herself. Which I guess is fitting, since she often felt that her marriage both brought her fame and limited her potential. I'm late to the Wild bandwagon, but I'm jumping on with both feet. A year or so ago, I took this book out of the library, but never got around to reading it. 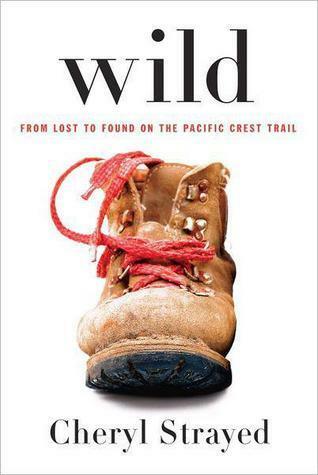 It wasn't until Strayed was on Radio West a few months ago that I decided I needed to listen to her story, about how at the age of 26, she started to heal herself from her mother's early death (and a childhood of abuse, which she doesn't talk about in the story), by walking the Pacific Coast Trail, alone, from the Mojave Desert in California to the Bride of the Gods near Portland, Oregon. Even then, I made it my phone book, which is the book I read waiting in the car pool line or at dance lessons, when I'm usually distracted by the babies, or lying on the floor of one of their bedrooms while they fall asleep. In other words, probably not the best way to get really sucked into a narrative. But once I got sucked in, I got sucked in hard. I'm the kind of girl who has always, always been a good girl. The most reckless thing I did as a teenager was moon a car full of boys once when I was sixteen. I went from living with my parents to my college roommates to my husband. And even then, I lived by the rules. I have conventional, conservative, suburban lifestyle. And I'm always, always, always surrounded by people. So I was fascinated by the choices Strayed had made that made her feel like she wanted to hike the PCT. She had gotten married at nineteen but cheated on her husband over and over in the last years of their marriage, which ended months before the journey. She did a whole bunch of heroin. She floated from job to job. She had major unresolved issues with almost every member of her family, including her dead mother. So hiking the PCT was almost a kind of self-imposed rehab-- she'd hike the trail and get her life back together. I was also fascinated by the fact that Strayed hiked alone. As an introvert with a husband and six kids, I don't have fantasies about escaping to exotic tropical locales. I have fantasies about escaping anywhere, even a Motel 6, where I could be by myself for a day or two. Strayed spent nearly three months almost entirely by herself. Yes, there were other people on the trail, but she'd go days without seeing anyone. I think that the solitude would be both a greater bliss and a greater challenge than the hike itself. And besides the honesty of her story and the sheer wow factor of it, Strayed is a totally fantastic writer. I got to the point near the end of the story where it had become like a drug for me-- I could not put it down. And when I did, I got right back on Amazon and ordered another of her books. This was as good as the hand pictures got. In my post about Eli's feet from a few days ago, there were a few people who were curious about his hands. I mentioned in that post that we haven't started the hand surgeries yet, but I thought I'd write a little something about his hands, what the plan is for them, and the long-term prognosis. It's hard for me to talk about Eli's special needs without comparing them to Rosie's. When we got Rosie's referral, we knew enough about cleft lip and palate that we felt relatively prepared. We also knew that once she was done with her series of surgeries, she would, in totally crude terms, be fixed. Her lip and palate could be repaired, her speech could be practiced, her nose could be straightened, she could get dental implants, and by the time she was a teenager, people might never suspect that she'd been born with any special need at all. When we got Eli's referral, we knew we were facing a different situation. Lots of adoptive parents say that limb differences are very manageable special needs, because kids are so resilient and usually adapt and make what they have work. The parents often say that they forget their kids have special needs at all. But unlike Rosie's lip, we were never going to be able to totally fix Eli's fingers or toes. As a best-case scenario, he might eventually, after surgery, have the use of both hands with some longer fingers and some shorter fingers. As a worst-case scenario, he might not have much use of either hand. We wouldn't know more until we went to China to adopt him. When we arrived in China, one of the first things I did was look over Eli's hands. His left hand is his "good" hand. He has a full pinky finger (his only finger with a fingernail) and about 90% of a thumb. The three other fingers are all short and banded together. It looks like he has about 75% of two of the fingers and about half of the third. This hand does everything. He has a great pincer grasp, feeds himself, colors, uses a fork-- you name it. The right hand is, even now, a little bit of a mystery to us. When we saw pictures of it, it looked like a ball of flesh, and we weren't sure if there were any fingers there at all. Sometimes it looked like he had part of a middle finger, but honestly we weren't expecting much. But it turns out that he has at least half of all five of his fingers. The middle finger is basically a normal length. The four other fingers were banded together at the tips. Part of each was amputated in utero, and the fingers are webbed up through the first joint, but they appear to have bone structure. We won't find out about tendons until the surgery later this month. Eli uses this hand for support. He can pick up small items (goldfish crackers) with the middle finger, and uses it to point. But we were delighted to find that the bones are there, and eventually we hope that it opens up like a flower blooming. There are two tiny pieces of skin, each about 1/4 inch long, holding the fingers together at the top, and it kills me a little bit that he has lived for 19 months with his hand like this-- removing those two pieces of skin would be simpler than taking off a mole, or performing a circumcision. Snip, snip, stitch, stitch, and he would have five fingers (webbed, yes, but still fingers). So what's the plan? On June 20th he will have his first surgery on his right hand. The surgeon will snip the bands between the fingers, and bring down the webbing between the thumb and pointer finger and between the middle and ring fingers. He will have outpatient surgery, followed by four weeks in a cast to protect the hand while it heals. Our surgeon is expecting that he will have four surgeries in all, two on each hand, all followed by casts. Apparently, it's not a good idea to operate on both sides of the same finger in a single surgery, which is why we have to have two surgeries on each hand. My guess is that it will take at least a year to complete the entire process. And after it's all done? We hope that Eli will have ten (little) fingers, and as long as he doesn't want to be a hand model, no one will be the wiser. Hopefully, his hands won't be an object of fascination and revulsion to the kids he meets like they are right now. Regardless, we know that he won't be stopped or limited by his hands, because they don't stop or limit him in any way right now. Yes, you saw that rating right. Three stars. 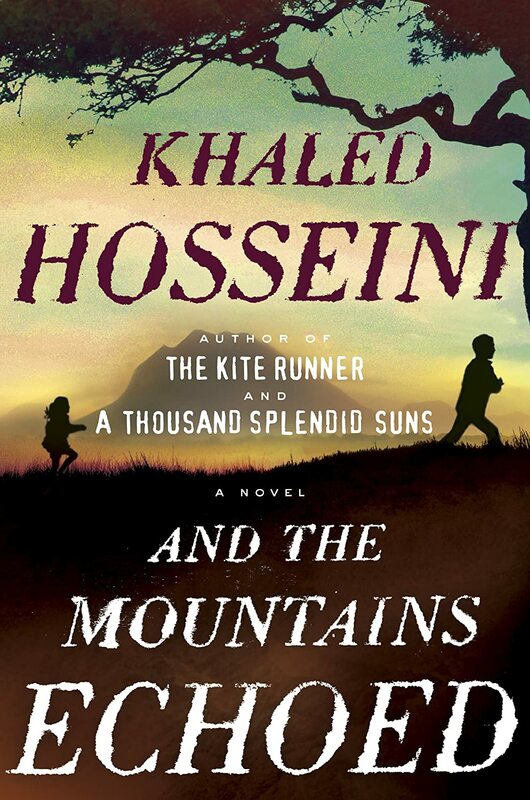 I know it's probably not fair, since Hosseini's writing in And the Mountains Echoed is just as beautiful and moving as it was in his previous two novels (The Kite Runner and A Thousand Splendid Suns, for those who have been living under a rock for the last decade). But my expectations were high-- Hosseini is a wonderfully gifted storyteller, and in his previous novels the stories were so rich and epic and heartbreaking and tragic and life-affirming that I felt like I had been living in those novels while reading them. They are two of my favorite books, ever. So the bar was set almost stratospherically high for And the Mountains Echoed. The story begins in 1952 near Kabul, where nine-year-old Abdullah and his two-year-old sister Pari are traveling from their small, impoverished village to visit their uncle in the big city. The three make the trip on foot, through the desert, and when they arrive, Pari is abducted/adopted by the wealthy family the uncle works for. Abdullah's heart is broken. This sounds like a promising beginning, right? But then the story jumps. We get the uncle's point of view, then jump to the adoptive mother's point of view after she and Pari move to Paris, then we jump to the present day and hear from a doctor traveling in Kabul. We hear from about a dozen different narrators, each somewhat related to the main story of Abdullah and Pari, but often very tangentially. Finally, in the last few chapters (spoiler alert) the brother and sister are brought back together again, but that feels unsatisfying, not just because of the plot elements but also because their time together felt so long in the past in terms of the narrative that it almost feels irrelevant. That said, And the Mountains Echoed is a book worth reading. If I stumbled on it at the library or started reading it based on Amazon's "Recommended for You" reads, I probably would have had an entirely more positive reception of the story, but I wanted it to be more moving, more epic, and more cohesive than it was. 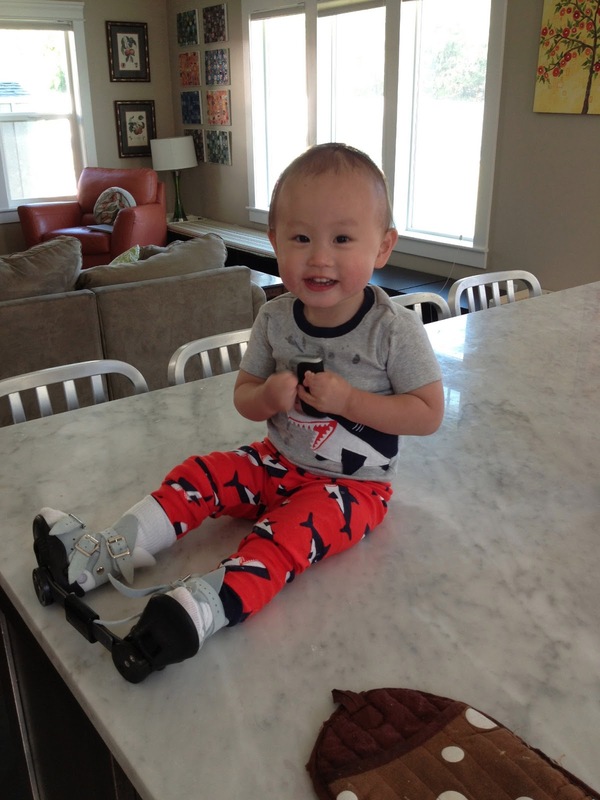 When we accepted Eli's referral last year, his clubfoot was almost an afterthought. We were so much more concerned with the fact that he's missing a big toe and that we couldn't tell what was going on with his hands (not to mention the fact that we'd only had Rose home for four months and couldn't quite fathom starting the process over again). For most of the last year, Eli's hands have been our biggest preoccupation, because they seemed like they might have the greatest impact on his daily functioning. But since we've had Eli, he's proven us wrong at every step. He doesn't let the fact that he only has one working finger on his right hand, and three digits on his left hand stop him one bit. And he hasn't been fazed by his clubfoot treatment either. We are very lucky to have both Primary Children's Medical Center and Shriner's Hospital for Children less than 15 minutes from home. We had heard wonderful things about the treatment plan at Shriner's, and got a great referral for an orthopedist (Dr. Hennessey), and they were able to start his treatment a little more than a week after we returned from China. 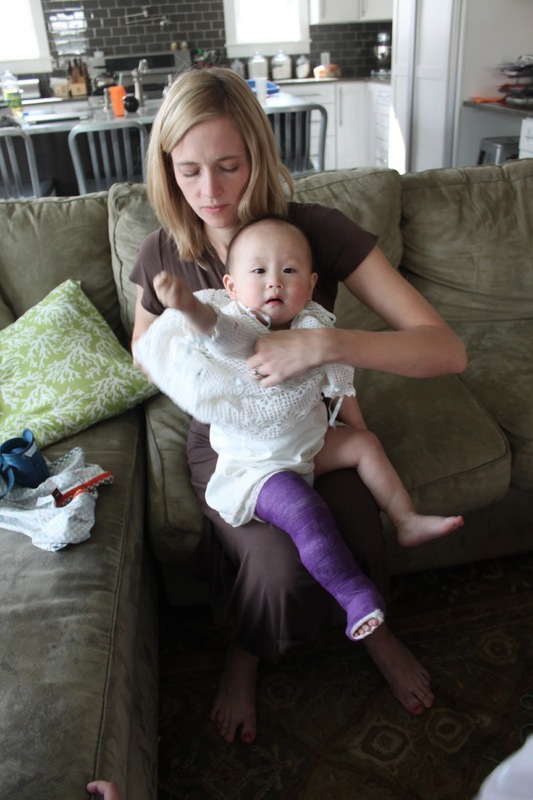 Most children with clubfoot are treated very shortly after birth. The preferred method of treatment is what is known as the Ponseti Method, which involves a series of casting, which the kids wear for a week or two at a time. So we were at Shriner's every Monday for the last few months, gettting Eli a new cast. We let the big kids pick the cast colors, and Eli sported, at various times, blue, orange, kelly green, purple, and lime green casts. The first week, we had x-rays of Eli's foot and got the first cast. His clubfoot was pretty mild, and related in some way to his other limb differences (all are a result of amniotic band syndrome, where parts of the amniotic sac strangle off digits or entire limbs). We were told that he would have somewhere between four and six casts, each that stretches the foot a little bit more. We're so lucky to live nearby, because most of the families who come to Shriner's travel long distances (Colorado, Wyoming, Idaho) with tiny babies. While there are many advantages to our situation, Eli's age was a significant disadvantage. Newborns are less likely to have a hard adjustment to the casts, but the first few nights for Eli were murder-- he was up at least 100 times a night for some of the first week. 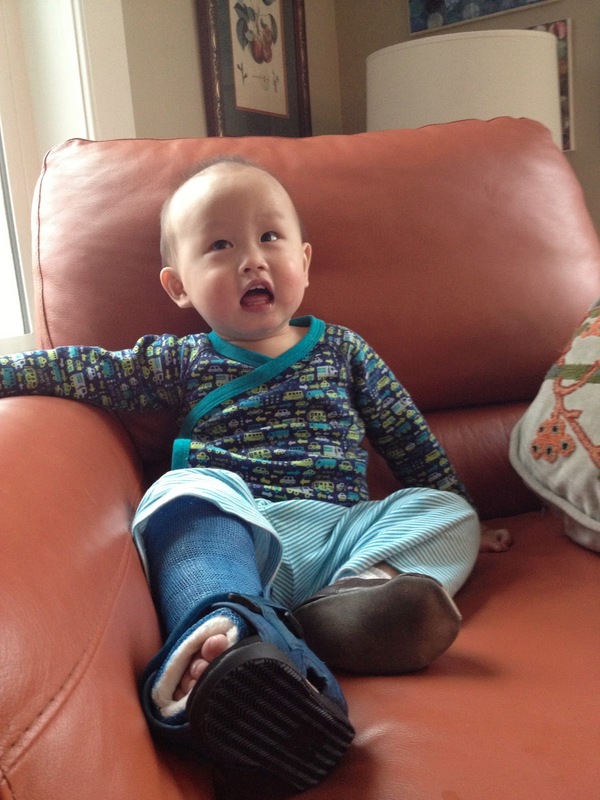 Newborns' bones are also more pliable, so while his clubfoot was mild, it wasn't going to be as easy to reshape it as it would be with a newborn. And walking with a cast is a lot harder than being carried around with one like a teeny baby. But Eli came through it like a boss. He wasn't a fan of the actual casting or uncasting, but he figured out how to run around on the toe-to-hip cast, and how to stand up with one leg fully unable to bend. He also rarely complained when the rest of the family hopped into the pool and he had to stay on the side and splash with his one good foot. We got new x-rays on the day Eli got his fourth cast, and Dr. Hennessey decided that he would need a tendon release procedure in addition to the casting. There are many different reasons why a baby might be born with a club foot. 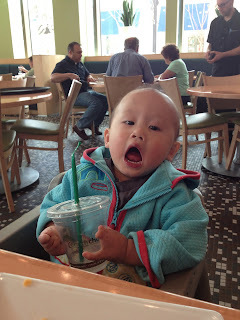 But for Eli, we were fairly certain it was because of his amniotic banding. However, he also has a fairly significant band on the calf of that leg, and the doctor thought that the band was making it difficult for the tendon to stretch the way it should. So four weeks ago he had the procedure. Newborns have the procedure in the clinic, but because of Eli's age, his was under general anesthesia. He did great, woke up happy, gobbled down two yogurts and two containers of Jello, and was home by lunch. Shriner's is a fantastic hospital. In fact, it doesn't feel like a hospital at all. We got to know the staff well because they took care of us week after week, and they'd all say hi and call us by name when we showed up. While Eli had his surgery, I got to wait in our private room (even though we went home the same day) instead of hanging out in a general surgical waiting room. We had a wonderful experience there. So now what? The casts are off, but in some ways, it feels like the process has just begun. Today Eli was fitted for his boots and bar today. He has to wear special boots with a snap-in bar for 18 hours a day. Once again, if he were a newborn, this would be no biggie-- but for a walking toddler, it feels a like a big deal. In three months, he'll only have to wear them at night, but I know that for the next three months, I'll be trying to squeeze out every minute in the boots and bar so he has plenty of time to run and play too. In the beginning, I was really worried about Eli's hands. I was devastated when I found out that we wouldn't have hand surgery until July (now moved up to June). But in some ways, it's been nice to get this casting process out of the way before he has casts on his hands too. But I'm happy to report that when the cast came off, Eli had two beautiful, straight feet. Feet that are perfect for walking on.